Character issues dogged Clinton again but his personality, his record of moderate policy initiatives, and a strong economy worked to his benefit. Clinton adopted conservative approaches to welfare reform, deficit reduction, and family values while holding to Democratic stances on the environment, health care, and education. Clinton made the Republicans' adoption of a conservative platform look extreme by comparison. Clinton's support by women and minorities helped him win re-election. 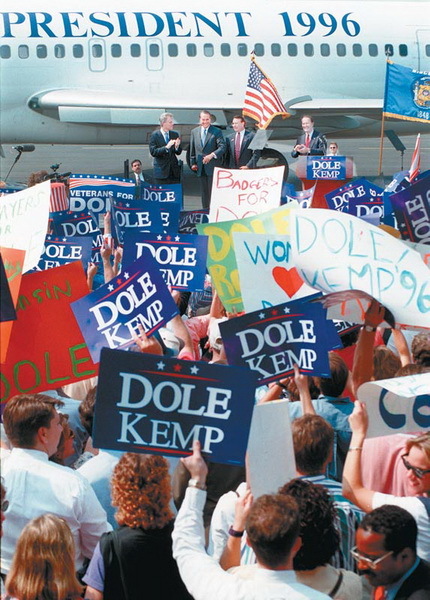 Bob Dole speaks at a campaign rally in Madison, September 5, 1996. Photo by Joseph W. Jackson III, courtesy of the "Wisconsin State Journal." 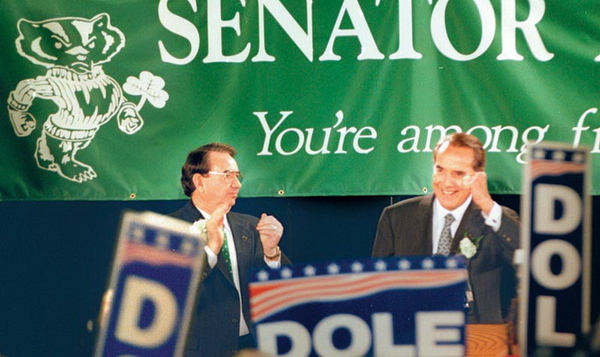 Wisconsin Governor Tommy Thompson greets Bob Dole at a campaign rally in Madison, March 17, 1996. Photo by Joseph W. Jackson III, courtesy of the "Wisconsin State Journal."